Ancient Cliff Houses were used as a shelter or house style that were inhabited by the ancestors of the Pueblo Native Indian tribes called the Anasazi. The ruins of cliff houses are can be found in Colorado, New Mexico, Arizona, Utah and also in parts of northern Mexico. The structures ranged in size from one room storage units to cliff house villages of more than 150 rooms. The Anasazi cliff houses were built between the 11th and the 14th centuries. Learn about the structure and the interior of the Cliff Houses with pictures and images together with facts and information about the people who lived in them. Definition: Cliff Houses were occupied by the ancient Anasazi people, the ancestors of the present Pueblo people. The cliff house dwellings were large communal habitations that were built on ledges in the canyon walls and on the flat tops of the mesas. Modification of a natural structure was common through digging and adding of stone or adobe walls. The ruins of cliff houses are can be found in Utah, Colorado, New Mexico, Arizona and parts of northern Mexico, the most famous being in the Mesa Verde National Park in Colorado. The people who lived in the Cliff Houses were the Anasazi, the ancestral Puebloans. The ancient Anasazi builders were, in culture, lifestyle and many aspects of architecture, much like the modern Pueblos. The name Anasazi derives from the Navajo word 'Anaasází', meaning "Ancient Ones" or "Ancient Enemies". The Cliff Houses could only be accessed by climbing ropes, ladders or through rock climbing. The Anasazi cliff dwellers were sedentary agriculturists who planted crops in the river valleys below their high perched houses. The Anasazi were excellent stone masons and choose to live in the cliff houses to protect their people from attacks by hostile enemies, such as the Navajo. In such attacks, or during periods of inter-tribal warfare, the ropes and ladders would be removed as an highly effective means of defence. Where was the Anasazi Cliff Houses built? Many of the rivers of the Southwest flow through canyons which are deep and narrow gorges cut in the solid rock. The Anasazi Cliff Houses were built on cliff ledges, or in natural caverns, hundreds of feet above the streams and rivers in the valley below, where their farms would have been located. The Anasazi people built three different styles of houses - the pueblos, the cliff house, the cave house. Some of the Anasazi Houses were built against the base of the cliff and positioned in such a way that they were part of one great building complex. On the ground floor of the complex there might be two rooms in front of a cave room, on the second floor there might be one room in front of another cave room, and on the third floor there might be only cave rooms. The Anasazi people soon moved from their cliff dwellings and began to build their houses beneath the overhanging cliffs, near to their farms. The Spanish encountered the villages and began referred to the people and their houses as Pueblos. The term 'Puebloans, derives from a Spanish word meaning "village dwellers". For additional facts refer to the Peublo Tribe and Peublo Houses. Building the Anasazi cliff houses was a dangerous, time consuming and arduous task. Cliff houses were cut in the soft rock with the most primitive Stone Tools such as picks, axes, adzes, tranchets and celts. Some of these dwellings were cut out as simple open caves and then walls were erected at the front of the dwelling. Others were cut so that the rock face remained serving as the front wall of the cliff house. In this type of house a hole was first cut for a doorway, and then the room, or rooms, would be dug out from it behind the cliff wall. The floors was carefully smoothed, and covered with hard clay and niches were cut out in the wall for people to store their possessions. Many rooms were plastered on the inside and decorated with painted designs. Vast numbers of pictures called Petroglyphs were cut and painted into the rock wall with images that represented the sun, the moon, human beings, mythical creatures, symbols and animals. There are literally hundreds of cliff houses and dwellings within the Mesa Verde National Park. The most important are located in Spruce, Soda, Rock, Long, Wickiup, Navajo, Moccasin and other tributary canyons. 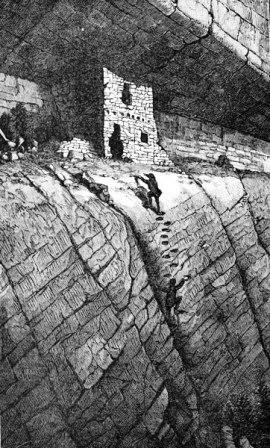 The largest cliff house ruins, known as Cliff Palace, were discovered by Richard Wetherill and Charlie Mason in 1888. 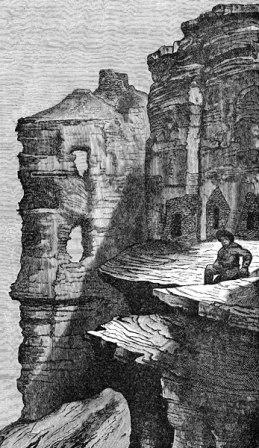 The largest cliff house ruins, known as Cliff Palace, were discovered by Richard Wetherill and Charlie Mason in 1888. 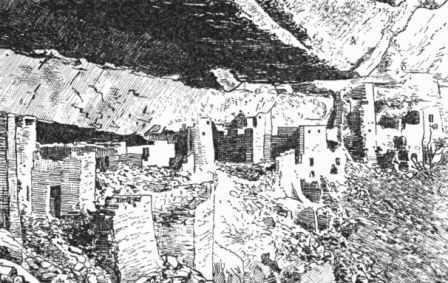 Cliff Palace was a massive community complex, over 300 feet long with a depth is just under 100 feet, containing more than 200 living rooms and 23 ceremonial rooms or kivas. The most outstanding structure in Cliff Palace is the two story round tower that stands south of the center of the cave. Another important structure was the home of an Anasazi village called Spruce Tree House. Spruce Tree House is a large cave that consists of 114 rooms that were used for family homes, storage, and other purposes. Many of the walls in Spruce Tree House were covered with a thin coat of reddish plaster and often decorated with paintings. Two of the Cliff Houses were used for purely ceremonial purposes and are called the Sun Temple and the Fire Temple.